It’s taken me years to overcome my childhood phobia of peas. Especially frozen peas. And while I’ve created some recipes over the years using the humble pea, I’ve always felt a little funny about them. Even though other people have been excited about my pea recipes, I’ve really struggled. Until now. Honestly I could happily eat this pea and pesto ‘mash’ by the spoonful. On it’s own. Even my green-food-phobic boys gobbled theirs up (all be it with some cohersion to try it in the first place). We loved this meal on a Summers night when I didn’t feel like heating up the kitchen. I simmered the sausages in the morning when it was still cool. Then at dinner I just browned them on the BBQ. Covered the peas in boiling water, drained and pureed with some pesto and dinner was ready. 1. Place sausages in a medium saucepan. Cover with water and simmer for 10 minutes or until just cooked through. Drain. 2. Boil the kettle. Place peas in a heat proof bowl and cover with boiling water. Stand for 60 seconds or until peas are defrosted. Drain and puree peas with the pesto using a stick blender. Or mash with a masher. Leaving them as smooth or chunky as you like. Taste and season with salt or some parmesan as needed. 3. Drizzle sausages with a little oil and brown in a frying pan or BBQ on a medium high heat. 4. To serve, divide pea puree between two plates. Top with sausages. Grate over some parmesan and pop lemon wedges on the side. WINE MATCH: A Summery dry rose. vegetarian – serve pesto peas with zucchini or chickpea burgers. different meat – the pesto peas are also great with chicken, lamb or fish. Or even a pork chop! dairy-free – skip the parmesan and use a dairy-free pesto. different veg – loving the idea of exploring other vegetable + pesto ‘mashes’. Thinking of trying broccoli and cauliflower next. carb-lovers – serve with mashed potatoes as well. Or crusty bread. more pesto – serve sausages with a dollop of extra pesto on top. no pesto / nut-free – make an ‘instant pesto’ by pureeing 1 bunch basil leaves, a clove garlic and a few handfuls grated parmsean with the peas. And enough extra virgin olive oil to bring it all together. Watch the recipe on You Tube. Sausages can be poached ahead and kept for 1-2 weeks in the fridge or frozen. Pesto pea mash can also be made ahead and ‘fridged’ or frozen. Just allow to come to room temp before using. Drools all throughout the read. Looking forward to more of this. Btw, If you’re in need of buying ingredients for your next recipe. I’ve found Doorstep Organics ( http://www.doorsteporganics.com.au/ ) as a big help. Feel free to visit their site if you wish to buy. Anyhow. Thanks for sharing this.I will surely try this recipe at home. I just read your article about throwing food away. I cringed! How about measuring the quantity of how much to cook and how much to plate? You are the scientist, me, not so much. I am sure I read it all wrong. I’ve been following you for years and you have always been above all the food fads. Wow interesting I made you cringe Liz… thanks for sharing your thoughts. Sausages can be hugely variable in quality. It’s one ingredient I’m super super fussy about my suppliers and still get mostly from a butcher in Sydney. Try to find an excellent butcher – their sausages will be so much better than supermarket bangers. Just made this and it was so good!! Thanks for the recipe Jules!! It looks healthy! I mean well, there’s a good balance of meat and veggies. Topping up with the cheese just makes the whole meal a much more enjoyable one! I might just replace the peas with broccoli instead! 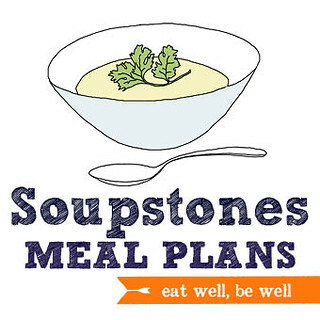 Jules, How much does it cost to join Stonesoup’s Meal Planner?